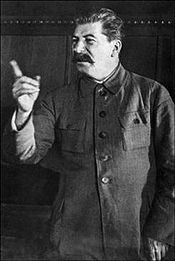 Stalinism is the most common form of Communist ideology and is associated with the Soviet leader Joseph Stalin. It is generally declared a form of Marxism-Leninism, but some historians consider it an extreme deviation. It is generally used to describe typical Communist states which engage in heavy repression of dissent and governance by an autocratic dictator, such as the Soviet Union during Stalin's leadership, Albania under the late Enver Hoxha, and today, North Korea. More generally it refers to the ideology following the succession of Marx > Engels > Lenin > Stalin, which was the official ideology of the entire Soviet Bloc as well as the Communist Party USA during the Cold War. Stalinism is distinguished from forms of Communist ideology which draw from Marx, Engels, and (usually) Lenin but not from Stalin, such as Trotskyism. Trotskyists are generally anti-Stalinists. Maoism and Juche are both forms of Stalinism which add on top of Stalin's ideology the additional teachings of Mao Zedong and Kim Il Sung respectively. Stalinism has been dubbed "red fascism" by The New York Times. Stalinism revolves around a centralized state, a high degree of totalitarianism, usage of a secret police and propaganda, and autocracy. Some critics declare Stalinism a caricature of communism and consider it to deviate far from its original intent. Stalinism is really more of a form of government rather than an ideology. It is an interpretation of the ideas of Marx and Lenin, for a transition from socialism to communism. However, some people who hold Marxist-Leninist beliefs consider Stalinism to be a perversion of their beliefs.